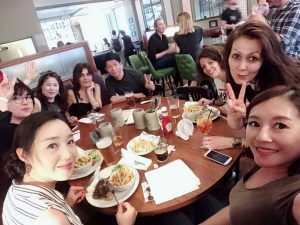 Not only does EC offer English lessons for adults in London, we also offer dinner club as part of our social program. Dinner club is a great way to meet other students, learn about other cultures, and try different food. Last week the cuisine was traditional British food, and next week we will be going to a barbecue restaurant. After a long day of English class, dinner club is also a way to relax and unwind. Every week we pick a new restaurant for students to try. London has so many great restaurants with different foods from around the world. Other than trying delicious foods dinner club is also a great way to learn about other students and their cultures. Last week we had students from Korea, Japan, Turkey, and Taiwan. The students shared experiences from their country and got to learn about each other’s countries. Getting involved in social activities is always a good way to meet new people and practice your English. Dinner club is not the only social event we offer. We also have meditation, walking tours, and dance classes. If you would like to learn more about our weekly social events make sure you check our social calendar. If you are interested in dinner club and want to get involved in our English lessons for adults in London look at our website.